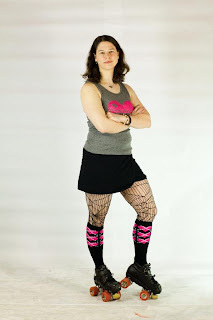 I'm a Bleeding Heartland Roller Girls league skater now, so that means LOTS of skating practice. I've been skating at least 4 or 5 days a week, sometimes more. There is SO much to learn. If you think roller derby is just a bunch of women hitting each other while skating around a track, you have it wrong. There is an amazing amount of strategy to this game.